Been Turned Down for LTC Insurance? I can help you with LTC Insurance! Have you been turned down for LTC insurance? Would you like to get some if you could? Give TheLongTermCareGuy.com a call at (920) 884-3030 and let’s get you a policy. I have two companies you can only buy from once you are already in a LTC facility. That’s right, already in care. Two different companies. I have a home care policy you may be able to get if you have been turned down for Parkinson’s, oxygen use, diabetes, stroke, etc. IF you are able to currently function on your own without any help from another person for at least 30 days, you can have coverage. It’s not even terribly expensive, but it’s only for care in your own home. It will pay a neighbor or a home care agency. If none of these work for you, or you have very little money left, I can help you protect some of it for family. If you are down to your last $10,000 to your name, would you like to leave that to family or children? I can make that happen. I am a LTC planner. I don’t just sell LTC insurance (although I have better options than most and way better advice on how much or how little to get), I help most anyone in dealing with LTC. If Medicaid will be your only answer let me walk you through what you should and shouldn’t do to get the best result. If you simply have questions, I’m here for you. Chances are I may even offer a bit of helpful advice. There is no cost to visit, that is how word spreads. 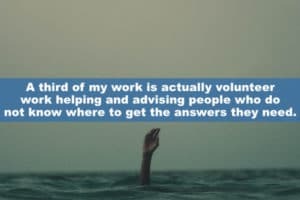 A third of my work is actually volunteer work helping and advising people who do not know where to get the answers they need. I’m nearly 69, it’s part of my volunteer work that I will continue until I cannot. So, if you have problems or questions, call TheLongTermCareGuy.com at (920) 884-3030 and let’s talk or meet. I’m here to help.